Very tempted to order this but do they normally charge any taxes? im tempted after a decent coffee machine..
can I just straight swap the plug over to a 3 pin or will I need an adapter? Is the warranty still valid? Am I right in assuming no you'd have to send it back to Germany if it went wrong? Nice deal but i'd be cautious of something like this going faulty and requiring replacement. Any ideas what the policy is for Amazon.de returns and shipping back to Germany? ask them to put it down as a gift and you won't have to pay any uk stamp duty. works every time. ask them to put it down as a gift and you won't have to pay any uk stamp … ask them to put it down as a gift and you won't have to pay any uk stamp duty. works every time. No need, it's in the EU - no extra taxes. for 291 euros (more now) I think it was £6 delivery and was here in less than a week. Fantastic machine, froths the milk as well ( you just put the tube in a cup of milk - automatic). I would look carefully at all reviews of the one in the op (I considered it) but a good few people on others sites/videos said it was less than reliable and after a while was nowhere near as good months down the line. Surely the point of the EU should be that it costs the same no matter what country with obvious adjustments for shipping. Buying it from the same company thousands of miles away and shipped internationally at a cheaper price just shows how farcical the whole system is. Or alternatively that they just like to rip us off in the UK. 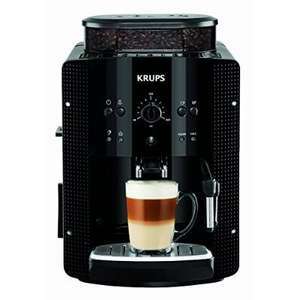 If anyone's near the East Midlands outlet place at Derby, theres a shop there that sells Krups coffee machines. I got my 850b for £200 cheaper than they were on Amazon. Worth looking there. I would look carefully at all reviews of the one in the op (I considered … I would look carefully at all reviews of the one in the op (I considered it) but a good few people on others sites/videos said it was less than reliable and after a while was nowhere near as good months down the line. There may be something in it, I bought a Krups machine few years ago, after some time quality of coffee has degraded, strange smell, and the brew was weak even with strength set to max. Tried different cleaning routines, machine was in service, no help, now it's stack in shed and it was £400. Or alternatively that they just like to rip us off in the UK. The pound to euro exchange rate fluctuates & it takes a while for market competition to cause prices to adjust. If the pound fell by 20%, prices of every single imported product would not immediately increase by 20%, but there would be a gradual adjustment. can I just straight swap the plug over to a 3 pin or will I need an … can I just straight swap the plug over to a 3 pin or will I need an adapter? Simply cut it off and add your own plug. great machine. would definitely recommend it. Doesn't that void the warranty? Can this also produce hot chocolate? ​Stamp duty? Is this a house?! Should be able to​ use the milk frother to heat the milk up then add hot choc powder. I ordered it the last time it was on Amazon.de and it was easy. Makes great coffee, the steam wand isn't as bad as people make out either. Never going back to instant. Delivery for me was quick and there was no additional fees/taxes added. The machine comes with a 2 year Krups guarantee which can be evoked by contacting Krupps directly within the UK. I bought an adapter for this as taking the plug off might invalidate the warranty. Also, buy an EU to UK adapter, a shaving adapter doesn't have enough ampage. Isnt the Latasima a pod machine??? I find living in the EU works as well. Expired already it seems. 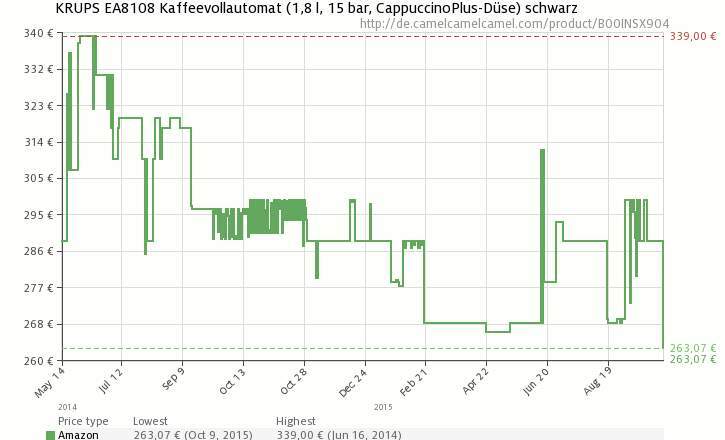 The amazon cost is €289 now, so £214 at the current exchange rate. ​ You're right, I'm getting my machines confused. The lattissima was my Nesspresso machine, my bean to cup is the magnifica s...doh! It is EUR 259,00 now.